Register Log In ECN Forum Forums Photos for General Discussion UL Listed Fittings? Well then what have we here?. Looks like 2" Galvanised Steel Water Pipe to me. And by the looks of the rest of the work in this area, it makes you wonder who is in charge of this place. I have seen this done before, outside to get around a foundation projection. It got red tagged and changed. 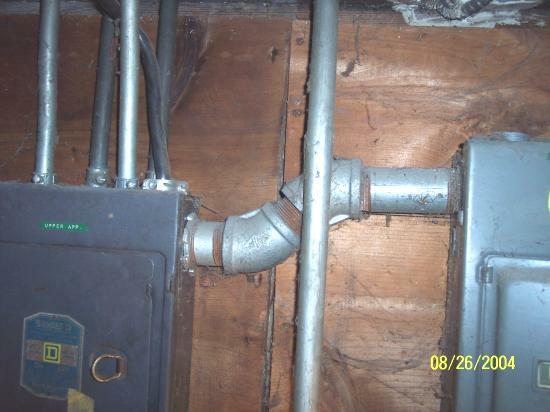 I have also seen a service where the "installer" used a plumbing Y to go from the service disconnect to two subpanels. This also got red tagged but, burned down before it was corrected. Because it was documented that the owner had done the work the insurance company only paid for the board up. Everything else was an out of pocket loss. Those of you in the business will probably see a number of issues here (and I would be interested in hearing about them). The thing that would concern me the most would be the sharp edges inside these fittings and the potential damage (either at the time of "install", or later) to the conductors. In my part of the world, I see this done regularly with PVC fittings in rural areas, where there is no AHJ. Looks like this was red-tagged at some point! And uh-oh, is that an FPE panel below the tag? mxslick: it sure looks like an early Federal panel. It's most likely a "main + range + 4"
equivalent of the Square D panels to the left. I wonder if the service from the meter hits this panel first, and then is double lugged to the panel to the left, and so on, instead of using a wireway for all three. the red (actually orange) tag is the Teleco ground wire identifier. 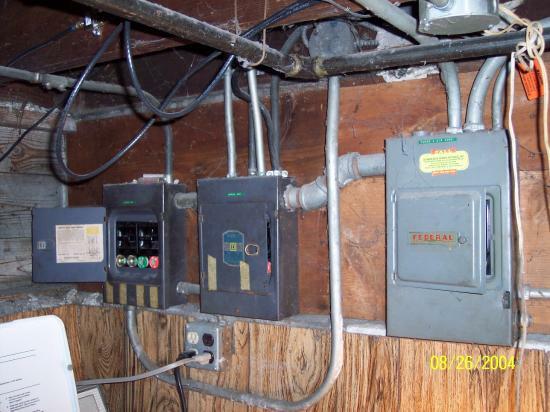 The service Duplex) enters into the far left panel then splits to the middle panel. The "plumbed in" panel is supposed to be a sub-panel, however, the #6 conductors to the main pullout were tapped under the terminal screws on the main of the middle panel. The zip cord was an extension cord that the homeowner used to plug in at the top of the stairs. It was connected to a "painters light." Reason: the basement light switch was broken. The other concern is the clearance here. The two far panels are blocked by the washing machine. We relocated service to provide required clearance. We installed 2-100Amp CB panels and got rid of the fuse boxes. What's that poking out from behind the door of that Federal panel?. How 'bout some pictures of the new install? Just a little thread-jack (sort of), if I may. Can anyone post a picture of an actual Red Tag?. I'd actually like to see one up close. I'm not insinuating that you guys have lots of them around to take pictures of. We don't have a Red tag system over here, instead going for the more pro-active system of Mr PoCo worker comes around and removes the fuse(s), until it's safe enough to carry electricity again. Some people I've met aren't too keen on this system, but it gets results mind you.